NORTH PORT, Florida (July 7, 2017) — The 207-acre parcel of land that used to be the home of Sabal Trace Golf & Country Club is being sold in a court-ordered foreclosure auction, with Tranzon Driggers marketing the property and managing the auction. The golf course is overgrown now, but the property includes the 12,000-square-foot clubhouse, according to Walt Driggers III, vice president of Tranzon Driggers. 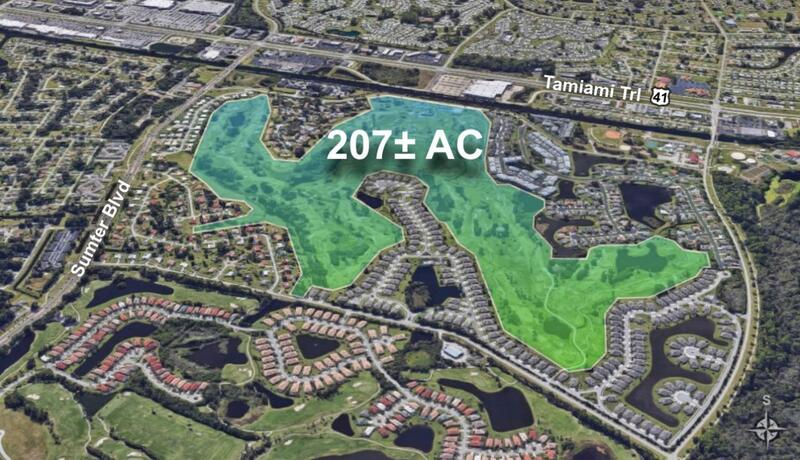 “It’s hard to find a tract this size, with this much potential — a high-profile location, in a fast-growing community mid-way between Ft. Myers and Sarasota, with off-the-charts demographics,” said Driggers. The golf course closed in 2015. The land, currently zoned Commercial/Recreation, can be used in a number of ways, but Driggers said recreation will likely be part of the mix. “There are existing plans for various development possibilities, including plans that include some 330 to 626 units, possibly with a smaller, nine-hole golf course or some other recreational component, such as trails for cycling or hiking. The clubhouse could be a central focus for future plans or could become a restaurant, club or other business,” said Driggers. The location is supported by both residential and commercial development, including major retail stores and restaurants. The Atlanta Braves announced in March that they intend to move their spring training operations to North Port in 2019 in order to be closer to the training camps of other Grapefruit League teams. The live auction, simulcast with online bidding available, will begin at 11 a.m. Eastern Wednesday, August 2, at Aloft Sarasota, 1401 Ringling Boulevard, Sarasota. Individuals seeking additional information may visit www.tranzon.com or call 877-374-4437.